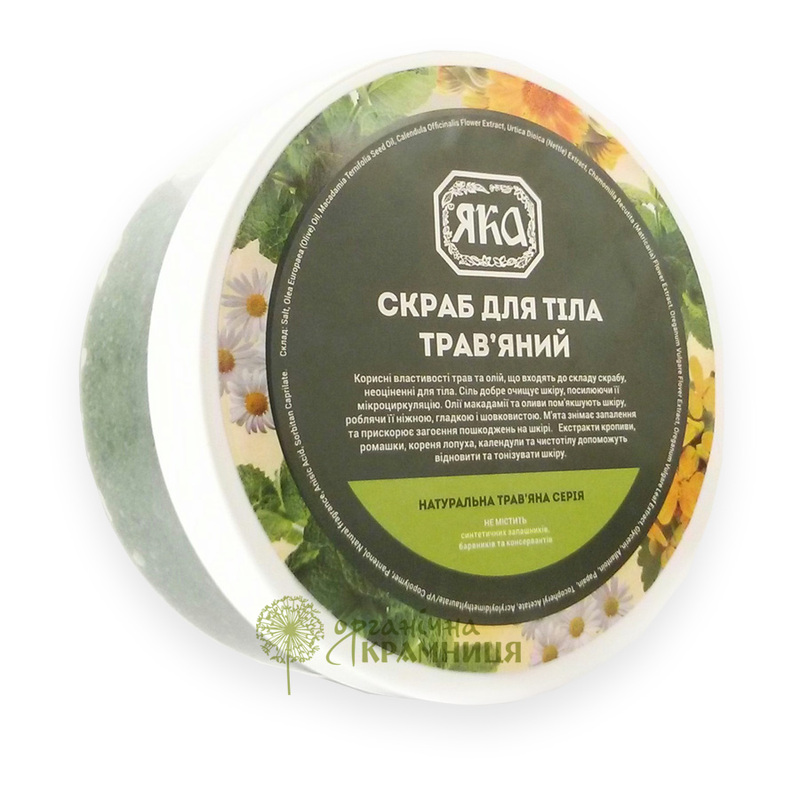 Herbal Body Scrub is produced by the Ukrainian beauty brand YAKA for its cosmetic series. It is formulated with natural ingredients and does not contain synthetic colourants, preservatives or fragrances. The scrub contains a combination of natural vegetable oils and herbal extracts that provide effective skin care. YAKA body scrub gently exfoliates your skin and helps to improve microcirculation. It contains olive oil and macadamia oil that soften your skin, make it smoother and silkier. The scrub also contains nettle, chamomile and calendula extracts that have regenerating and energising properties and help to speed up the healing of minor skin injuries. The product has a light, pleasant scent. It is free of SLS and SLES, animal fat, synthetic colourants and preservatives, E numbers. Not tested on animals. Directions. Apply to wet skin with circular motions. Thoroughly rinse with warm water. Best used once or twice a week. Ingredients. Salt, Olea Europaea (Olive) Oil, Macadamia Ternifolia Seed Oil, Calendula Officinalis Flower Extract, Urtica Dioica (Nettle) Extract, Chamomilla Recutita (Matricaria) Flower Extract, Oreganum Vulgare Flover Extract, Oreganum Vulgare Leaf Extract, Glycerin, Allantoin, Papain, Tocopheryl Acetate, Acryloyldimethyltaurate/VP Copolymer, Pantenol, Natural fragrance, Anisic Acid, Sorbitan Caprilate. Want to buy Herbal Body Scrub? Call us or submit your order via our web site!